WASHINGTON ? The commercial spaceflightcompany Space Exploration Technologies (SpaceX) said this month that it expectsto launch its cargo-carrying Dragon spacecraft on a maiden flight to the InternationalSpace Station (ISS) sometime between May and November 2010. The Hawthorne,Calif.-based company said it conducted the first Dragon operations training sessionwith NASA astronauts in October to bring them up to speed on how the stationcrew will interfacewith the capsule while it is approaching and berthed to the station. ?Three ofthe participating astronauts ? Tracy Caldwell Dyson, Shannon Walker and DouglasWheelock ? 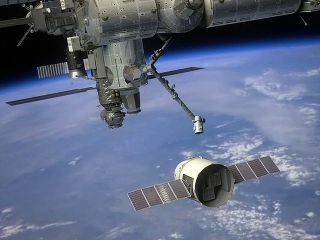 will be on board the ISS when Dragon makes its first visit under theCommercial Orbital Transportation Services (COTS) program,? SpaceX officials saidin a recent statement. SpaceXdeveloped Dragon in part with NASA funding provided under the COTS program. Thespace capsule is designed to flynear the space station and then be grappled by the outpost?s robotic arm soit can be attached to a berthing port. The threenamed astronauts have been assigned to the Expedition 24 crew slated to beaboard the station between May and November 2010. ?This wasthe first time the NASA astronauts who will interact with Dragon during itsearly mission were actually inside a Dragon flight vehicle,? said SpaceX ChiefExecutive Elon Musk. SpaceX isunder contract to NASA to conduct three COTS demonstration flights with Dragonvehicles. Those tests would then be followed by 12 cargo flights between 2010and 2015. The NASA cargo contract with SpaceX is worth $1.6 billion. Dragon?slaunch vehicle, the Falcon 9 rocket, is expected to makeits debut in early 2010. That mission will carry aloft a Dragon capsule,but it will not rendezvous with the space station.